Delegate: Prof. Subodh Mhaisalkar , Energy Research Institute @ NTU (ERI@N). Singapore is an islandic nation located in the heart of South East Asia with a total land area of about 721.5 km2 and with a population of about 5.64 million as per data provided by the Department of Statistics Singapore in September 2018. In its Climate Action Plan released in July 2016, the Government devised four strategies to achieve a sustainable and vibrant low carbon economy: improving energy efficiency, reducing carbon emissions from power generation, developing and demonstrating cuttingâ€�edge lowâ€�carbon technologies, and through the collective action of the Government, individuals and businesses. In 2015, Singapore pledged to reduce its Emissions Intensity (EI, or GHG emissions per unit of GDP) by 36 per cent from 2005 levels by 2030, and stabilise emissions with the aim of peaking around 2030. This makes the country more determined to establish different energy efficiency measures and to harness alternative sources of energy. The Green-e Renewable Energy Standard for Singapore allows Green-e Energy certification of renewable energy products throughout Singapore, in order to accelerate the development of renewable generation and renewable electricity markets, and to provide consumers with a meaningful mechanism through which they can express demand for renewable electricity (Green-e, 2017). Instead of subsidies, Singapore has taken proactive steps to introduce regulatory enhancements to facilitate the entry of renewable energy when such technologies become commercially viable (EMA, 2017). The Government's support for renewables mainly comes in the form of funding for Research & Development to develop capabilities within the industry. More than S$800 million public funding has been set aside by the Singapore Government for research in energy, water, green buildings and addressing land scarcity, of which S$140 million is allocated for research into clean energy technologies under the banner of the Energy Innovation Programme Office (EIPO) (EDB, 2015). Ocean renewable energy has been identified as one of the prominent alternative energy by ERI@N specifically towards remote coastal and islandic region as part of its strategic research interests. The Government also welcomes clean technology companies to use Singapore as a ‘Living Lab’ to testbed and demonstrate innovative solutions before scaling up for the rest of the world. In 2017, the Singapore Economic Development Board (EDB) also secured investments from six clean energy companies worth $500 million for next five years (EDB, 2017). ERI@N, supported mainly by the EDB, focuses on the areas of sustainable energy, energy efficiency infrastructure and socio-economic aspects of energy research. Its mission is to be a centre of excellence for conducting advanced research, development and demonstration of innovative solutions, which have both regional and global impact. The Institute has considerable expertise and strength in areas of offshore energy, which includes wind, wave and tidal energy and complementary technologies, such as energy storage, micro grids, and smart energy systems, and collectively provide an integrated set of expertise from materials design & synthesis, device fabrication and modelling, and systems integration and optimization. ERI@N’s Wind and Marine (W&M) research programme is aimed at improving the performance, lowering costs and accelerating deployment of offshore renewable technologies specific to the tropics, where unique technology challenges exist. It advances the technology development and commercialization through early collaboration with industry. It works closely with government agencies to understand regional needs, and with local and global renewable energy firms to identify technology gaps. The Sentosa Tidal Test Site is a joint collaboration between Sentosa Development Corporation (SDC) and ERI@N, funded by the Ministry of Trade and Industry’s Core Innovation Fund. This project aims to showcase tidal energy extraction as a feasible and sustainable energy generating technology in Singapore and to provide opportunities to develop local technologies to harness the energy available in the narrow channel between Singapore and Sentosa. 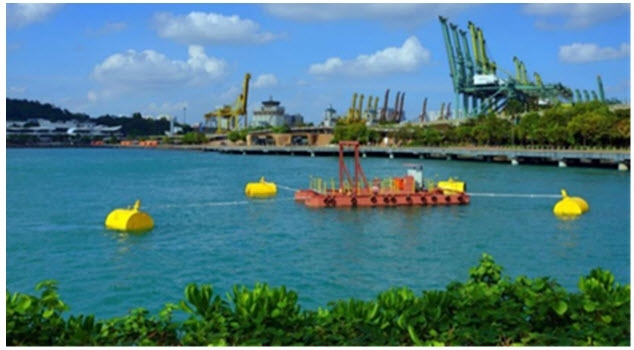 In November 2013, ERI@N and SDC officially launched the Sentosa Tidal Test Site (NTU, 2013). Recent developments on the test site include the deployments of tidal turbines supported from the floating barges. Also, novel concepts such as anti-biofouling coatings are being evaluated for better field performance. The power developed is used for electric lighting on the boardwalk. In June 2017, MAKO Tidal Turbines commenced research in collaboration with Energy Research Institute @ Nanyang Technological University (ERI@N) Singapore to evaluate the performance of its MAKO.4 tidal energy turbine in Singapore tropical water conditions. Singapore was selected by MAKO turbines because of its Government’s active support for hosting and nurturing the development of renewable energy, availability of suitable tidal flow and its proximity to Asian markets. ERI@N tidal site was used for this turbine demonstration project. ERI@N was actively involved in this project in deployment and in evaluating the performance of the MAKO.4 tidal energy turbine. ERI@N also performed studies related to the impact of tropical environment on tidal turbine as well as on its performance. In the interest of promoting sustainable energy solutions to achieve energy security with reduced carbon footprint from tropical regions, the Energy Research Institute at Nanyang Technological University (ERI@N) works with international partners in developing and test bedding tidal in stream energy systems for island conditions with micro grids architecture. Recent developments include the deployment of scaled tidal turbines supported from the floating barges. Figure shows the barge based tidal system which is further scalable to any site flow conditions to operate in any south East Asian country. The project was developed through a collaborative effort of Energy Research Institute at Nanyang Technological University (ERI@N) together with Schottel Hydro, OceanPixel and Lita Ocean Pte Ltd.
REIDS aims to power Pulau Semakau, an island south of mainland Singapore, which serves as a landfill, purely through renewables, including ocean energy. First of its kind in the region, the hybrid micro grid will facilitate the development and commercialization of energy technologies suited for tropical conditions that will help address the growing demand for renewable energy technologies in Asia. REIDS will integrate multiple renewables and novel technologies such as power-to-gas technologies and smart hybrid grids and enable the development of solutions suited for small islands, isolated villages, and emergency power supplies. The REIDS onshore project aims to solve engineering, economic, environmental and societal energy transition challenges for off grid communities. It customizes grid science towards remote islandic needs and integrates various renewables. Technologies deployed at the test bed include solar photovoltaic, wind, tidal, energy storage, bioenergy, innovative water desalination, hydrogen production, etc. Presently, work is in progress to make the island energy self-sufficient with its renewable sources. The offshore renewable energy integration and demonstration (Offshore REIDS) project, also termed as Tropical Marine Energy Centre (TMEC), has been initiated by ERI@N and financially funded by the ClassNK firm (a Japanese classification society) and seeks to pave the way for establishing the world’s first scaled marine renewable energy testing facility for tropical needs. In March 2015, the feasibility study for the test sites was officially launched and is expected to be completed by December 2017. During this project, the resource mapping methodologies are well utilized to identify the ocean energy potential of the southern islands of Singapore that have been identified from the Maritime Port Authority of Singapore (MPA). Presently, an environmental impact assessment (EIA) for the test sites is being carried out to understand the impact of ocean energy system deployment on marine life and environment. The EIA includes investigating the baseline conditions, possible effects of the test sites in the surroundings, and other associated research, such as underwater acoustics, water purity, sea level changes, tidal flow effects, etc. Geotechnical and geophysical surveys are also being planned. The outcome of this project will be extended towards Singapore’s guidelines and standards development by working with Spring Singapore to support local supply chain’s marine energy resource mapping guidelines of new regions, such as our neighbouring region of Southeast Asia and other tropical islands and remote coastal regions. Overall, the present project aims to develop technologies and a methodology for meeting energy needs towards the remote island region. Energy Research Institute @ Nanyang Technological University (ERI@N) with support from Singapore Government is planning to deploy clean energy powered water generation system and renewable systems on southern islands of Singapore in order to support the water and energy needs of southern islands which attract large number of tourists every year. Singapore’s Economic Development Board (EDB) has issued a request for information to explore the feasibility of a 100 MW floating solar project. The proposed facility will generate electricity for private sector consumption after construction. Such a facility will save 52,000 tonnes of carbon dioxide (CO2) emissions per year. 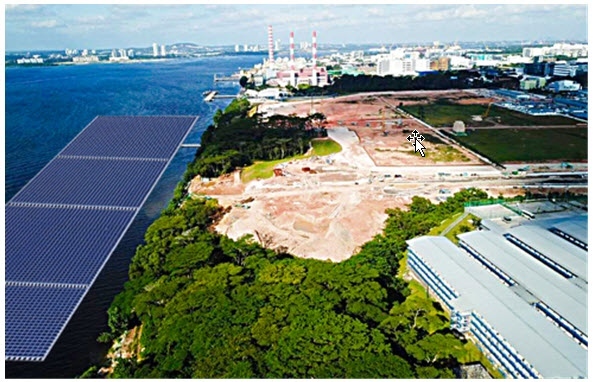 Sunseap Group, Southeast Asia’s leading sustainable energy provider, is developing one of the world’s largest offshore floating photovoltaic (OFPV) systems to be located north of Woodlands Waterfront Park, along the Straits of Johor. Supported by the Singapore Economic Development Board (EDB), the 5 MegaWatt-peak (MWp) floating solar system will generate about 6,388 MWh of renewable energy annually, once completed. The main goal of this workshop is to prepare a Tidal Energy Resource Modelling Guideline report through the study of the various factors affecting the result of the simulations. This is likely to be a joint exercise effort concentrating on the accurate modelling and reporting of tidal energy resources. As great multitude of tools and techniques are used to determine the amount of tidal resources and to quantify the resources available in different parts of the world, establishing a standard in extractable resource modelling can pave the way in promoting the adoption of tidal energy among the various stakeholders, as it can provide confidence in the amount of available resources. An International Tidal Energy Working Group is thus consequently formed and various research teams can conduct extractable resource studies to share their results and methodology, and work towards creating a standard report for modelling in harnessing tidal energy. These workshops were organised and hosted by Energy Research Institute @ NTU (ERI@N), Singapore, through teleconferencing on 14th May 2018 and 9th November 2018. The Third Asian Conference on Energy, Power and Transportation Electrification (ACEPT) was organized by Energy Research Institute @ NTU (ERI@N), as a part of Asia Clean Energy Summit (ACES), and was held in conjunction with Singapore International Energy Week (SIEW 2018) in October 2018. ACEPT 2018 cooperated with the Institute of Electrical and Electronics Engineers (IEEE) to bring together the world leading experts to present emerging topics on energy, power, and transportation electrification. International Floating Solar Symposium was organised by Solar Energy Research Institute of Singapore (SERIS) as a part of Asia Clean Energy Summit (ACES) and was held in conjunction with Singapore International Energy Week (SIEW 2018) in October 2018.